November is “Family Literacy Month.” The library will present two programs to encourage you to enjoy books and reading with your family: Saturday, November 24, 1 p.m. Storyteller Big Ryan and Thursday, November 29, 6:30 p.m. EBook author and Marshfield resident Lisa Vallier. Marshfield Historical Society has an exhibit on loan about archaeological artifacts found in Marshfield. It is located in the display case outside the Historical Room in the library. Thank you to Marshfield DPW for removing shrubs at the library’s crosswalk to increase visibility for drivers and pedestrians. following a patriotic sing-a-long. The program is free and open to the public. program room are handicapped accessible. November is family literacy month and the library will host two special events for children and families. On Saturday, November 10th at 10:30, singer/guitarist Mama Steph will perform for preschoolers and their parents/caregivers. The performance is free of charge and no registration is necessary to attend. On Saturday, November 24th at 1:00 pm. Story teller Big Ryan of Big Ryan’s Tall Tales will perform for kids and their families. In addition, weekly story times for children age 0-7 continue. 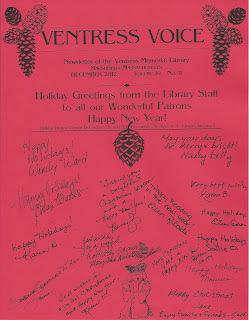 Stop by the children’s room, or visit our website www.ventresslibrary.org for more information. Books in Boo! was great fun for all here at the library from October 22 to October 31. Prizes were won, displays were gazed at, and Jacky O’Lantern was always found no matter where she hid in the library! Did you sadly miss this wonderful event? Photos have been put up on the library’s Facebook page which you can access from our main webpage. Check out all the fun we had! Did you know you can get discounted passes to various museums in the area? The library offers passes you can reserve for our Marshfield residents. Some of our popular passes are the Boston Children’s Museum, Science Museum, MFA, Heritage Museum and Gardens and Plimoth Plantation. Check out our full list of passes on our website or call and reserve a pass at 781-834-5535. Looking for a good book? The library’s weekly blog is updated every Tuesday and Friday. Find the New Books Blog on the library’s homepage www.ventresslibrary.org under Our Blogs. Suggestions are also always welcome and highly appreciated. Tuesdays are Teen Pick of the Week! Also check out our Live Facebook Reader’s Advisory, anytime, anywhere! Log on to the library’s Facebook page and post the last 3 books you have enjoyed and librarian, Amy Boivin will find you your next read. Circ Stats: The library circulated 15,743 items in September! Cooks note: This is a soft "cakey" cookie. It goes great with coffee, tea or cocoa. Enjoy the bounty of the fall season!! Combine pumpkin, sugar, vegetable oil, and egg; mix well. In separate bowl stir together flour, baking powder, cinnamon, ginger and salt. Dissolve baking soda with milk and stir in; add flour mixture to pumpkin mixture, mix well. Add chocolate chips and vanilla. Drop by spoonful onto greased cookie sheet. Bake about 10 minutes at 350 degrees (until lightly browned). First Annual Books in BOO! Are you ready for some SPOOK-TACULAR fun in October? The library staff is eagerly anticipating the staging of our first “Books in BOO!” From October 22 until October 31, we will be featuring some of our favorite Halloween books throughout the library. Come and enjoy some scary, creepy and delightful displays! And then. . . .to add to the excitement. . .each day, somewhere in the library, hidden in a deep, dark corner will be. . .”Jacky O’Lantern!” Here is how it will work: find “Jacky”; tell us how Jacky is dressed that day; write down the title of a book nearby; and enter our drawing. Adults, teens and children are welcome to participate. Children may enter each day. They will receive a small prize and be entered into a drawing for a daily prize. Adults and teens may also enter each day to receive one grand prize for each age group at the end of the show. Don’t miss “Books in Boo!” This promises to be the start of another great tradition at the library -- Happy Halloween!! The library recently received a very generous anonymous gift of $500 to be used as needed. The money has will be applied to the severely reduced book budget to buy new materials. A big “thank-you” goes out to this donor for his/her kindness and generosity! 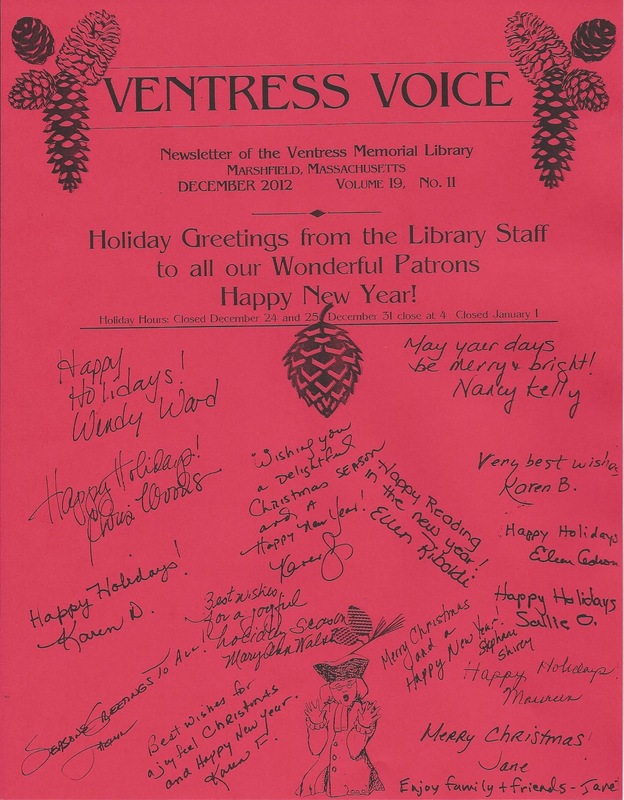 VENTRESS LIBRARY CULTURAL SERIES UPCOMING EVENTS! Come hear percussionist Ed Sorrentino and fellow jazz musicians play audience favorites with a few surprises. Special guest is jazz vocalist Melodee Savage-Roderick who has performed professionally on Broadway, off-Broadway, in national tours and in regional theatre as a singer, actor and dancer. She has received critical acclaim for her performances of Duke Ellington’s music. Relax on a Saturday afternoon with the mellow sounds of jazz! The library circulated 19,918 items in August! Fall story times are ongoing. We have three story times: Tales for Tots, Story Time, and Story Craft. Only Story Craft requires registration. Please see the webpage or pick up a flier in the children’s room for more information. Singer/guitarist Mama Steph will be performing on Saturday, October 13th at 10:30. This performance is appropriate for young children and their caregivers, is free of charge and requires no registration. The library will participate in Trick or Treat Marshfield Center again this year. Children’s librarian, Wendy Ward, will hold a “Not too spooky story time” at 1 p.m. in the program room of the library to kick off the event. This month I'm highlighting several new CDs which feature superb performances from musicians who specialize in trumpet, electric bass guitar and classical guitar. Chris Botti - Trumpet - "Impressions"
Botti, the world's largest selling jazz instrumentalist, has created a beautiful compilation of romantic melodies from around the world. Botti's musical artistry on the trumpet is mesmerizing in that the instrument seems to take on vocal qualities. Botti's selection of guest artists who perform on this album are diverse yet perfect choices to complement the tone of the album. "Losing You," written by Randy Newman, features Vince Gill's poignant, tender vocals and closes with a crystalline trumpet solo that leaves the listener soothed by Botti's passionate interpretation. Andrea Bocelli performs on "Per Te" ("For You"), a gentle and meditative composition written by Botti and David Foster, multi-talented producer, songwriter and musician. Foster and jazz great Herbie Hancock also guest as pianists, and Mark Knopfler (Dire Straits) adds vocals and guitar on the album's closing tune "What a Wonderful World." Listeners will love to linger on this soothing, gentle musical journey. Marcus Miller - Electric Bass Guitar - "Renaissance"
Marcus Miller, a composer, producer and multi-instrumentalist, has worked for many years as a session musician. He has won numerous Grammy awards as a producer for other artists, and now with "Renaissance" has released a top-notch CD of great grooving jazz which he produced, arranged and composed. Miller plays a Fender electric jazz bass and specializes in the "slapping the bass" technique - sounds like the bass guitar heard on the soundtrack from the television series "Seinfeld." The CD includes an ensemble of players featuring alto saxophone, trumpet, guitar, piano, percussion and drums. Miller takes the electric bass to new levels, and like Chris Botti, gives the instrument its own voice as if it's the lead vocal. Miller shines on a layered bass solo on the Jackson Five's classic "I'll Be There" - you'll really hear the versatility and sensuality of this instrument. Sharon Isbin - Classical Guitar - "Guitar Passions"
World renowned classical guitarist Sharon Isbin honors her guitar heroes who are a diverse group of classical, rock and jazz musicians. The selections on this album, inspired by South American and Spanish roots, will leave you totally immersed in the brilliance and intensity of the classical guitar. Isbin collaborates with jazz guitarist Stanley Jordan and rock guitarist and vocalist Nancy Wilson of Heart. On "Allegro" Isbin and rock guitarist Steve Vai soar to great heights as they blend their classical and electric guitars flawlessly. Perhaps the most interesting collaboration is on "O Presidente" with Paul Winter featured on soprano saxophone. Listening to these performers, who are masters of their chosen instruments, is an incredibly satisfying and captivating experience. I hope you too will find enjoyment in these passionate performances by these tremendously talented artists.